Wooboo Mini Cooli Portable USB Rechargeable HandHeld Air Conditioner Summer Cooler Fan,Batteries Powered No Leaf Fan for Kids (Blue) is a good product. 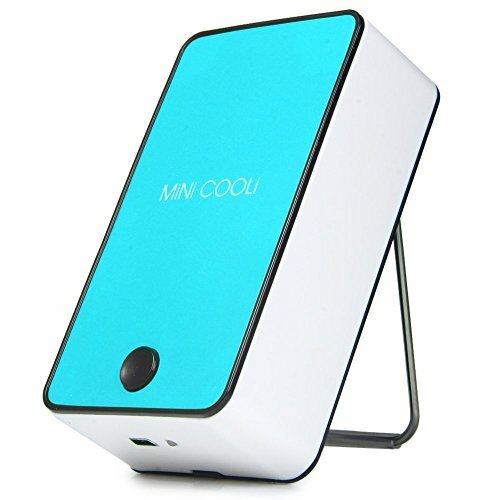 You can read the information of Wooboo Mini Cooli Portable USB Rechargeable HandHeld Air Conditioner Summer Cooler Fan,Batteries Powered No Leaf Fan for Kids (Blue), for the deciding on a purchase. ♥ Fashionable and rechargeable USB fan, built-in battery(1400mAh ). comes with USB cable. ♥ Mini Cooli Fan With unique double usb mini fan and mini bladeless air conditioner. ♥ Wet the water-cooled sponge, put it in the sponge slot. No Leaf Fan will give you wet breeze. ♥ Anti-skid stainless steel frame holder: Adjust the wind direction you like. -Fashion Rechargeable mini Fan, built-in Lithium battery,comes with USB cable. 1. This machine isn’t waterproof, so when you wet the sponge, please take it out. 2. Don’t fill too much water into the sponge in case the water will spill out and wet the machine. 3.Remember to take the sponge out and dry it when you don’t use the fan. Step1: Fully charge before first usage(Indicator light turn to green). Step2: Open the backside cover and take out the sponge. (Rinse sponge with detergent before first usage). Step3: Wet the sponge by soaking in water for 1-2 mins, make sure no overflowing. Put it back into the mini cooli. You can enjoy cold wind now. Tip: Add a drop of essential oil or perfume to sponge will make you feel cool and relaxed. Wooboo Mini Cooli Portable USB Rechargeable HandHeld Air Conditioner Summer Cooler Fan,Batteries Powered No Leaf Fan for Kids (Blue) with high quality product, you’ll like Wooboo Mini Cooli Portable USB Rechargeable HandHeld Air Conditioner Summer Cooler Fan,Batteries Powered No Leaf Fan for Kids (Blue). You can read more details of Wooboo Mini Cooli Portable USB Rechargeable HandHeld Air Conditioner Summer Cooler Fan,Batteries Powered No Leaf Fan for Kids (Blue) at text link below.